click here for tickets and join the celebration! 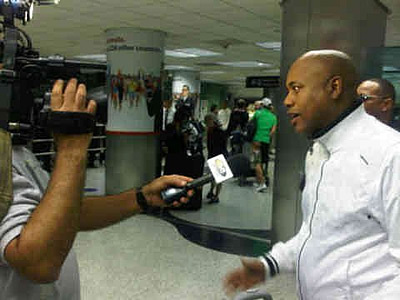 This, my friends, is a picture of David Calzado at Miami International Airport, taken today! Tomorrow night, Tuesday, Dec. 22nd, Charanga Habanera finally returns to the Bay Area after 9 long and extremely painful years. Click here for tickets and join the celebration! I think it would be bigger news if Tiempo Libre DIDN'T get a Grammy nomination. These guys are relentless. On the heels of playing The Tonight Show and Dancing With The Stars, Tiempo Libre has gotten it's THIRD Grammy nomination for Bach in Havana. Methinks this is going to be a good year for Cuban music folks. Check the Tiempo Libre News Page for more details.